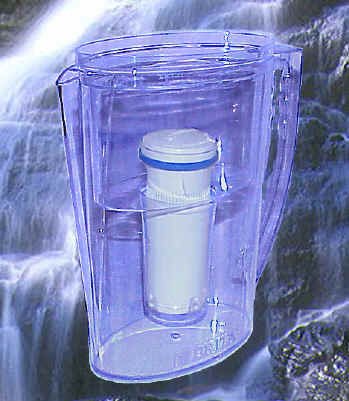 In use, the FRI is snapped onto the top of the Brita filter and then the pair is placed in the pitcher. The cap of the FRI rotates gradually as the pitcher is repeatedly filled, and eventually the caps pointer indicates that it's time to change the filter. A stainless steel spring provides motive force to the rotating cap, while an elastomeric membrane "senses" the presence of water via pressure and controls an internal gear train mechanism. 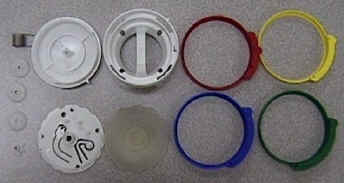 A user replaceable colored ring allows calibration for the various capacity pitchers. 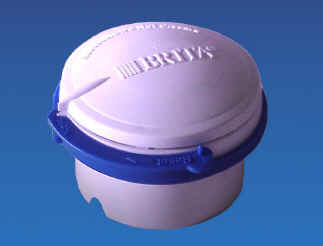 The Brita Filter Replacement Indicator (FRI) is usable with all Brita pitchers. It counts the number of times the pitcher is filler with water, thus showing the consumer when the filter is used-up. The FRI is a project that Rick Fayram worked on for several years in close association with PacifiX Product Development (Alex Huang and John Stigglebout), as well as with PacifiX's client Brita's staff. Rick worked closely with Alex and John in both concept and testing development. Rick also had primary detail responsibility on the 3D CAD solid models developed to control the construction of injection mold tooling, and worked closely with the Injection Molder on design refinements for mass production. The FRI is produced in quantities of millions per year. The housing is molded in high impact styrene. Internal gears are also HIP. Development techniques included ideation sketching, 2D & 3D CAD models, stereo lithography prototypes, model-shop built prototypes, and injection molded prototypes. 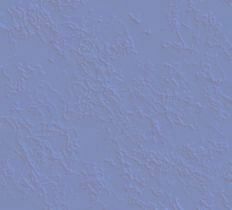 The final design was CAD modeled in AutoCAD R13 solids.